A notice about dangerous arsenic levels from the city of Creswell in 2008 turned UO geologist Qusheng Jin from a lab-based modeler into a field researcher. His curiosity generated what he called "A Wild Hypothesis" about a bacterial process possibly being in play in the region's aquifer. Already adept at building computer-generated models of microbial bacterial reactions in natural systems, his transition to fieldwork was easy. He started small, with an internal UO seed grant to begin gathering water samples. Next came a grant from the National Science Foundation to test his theory. 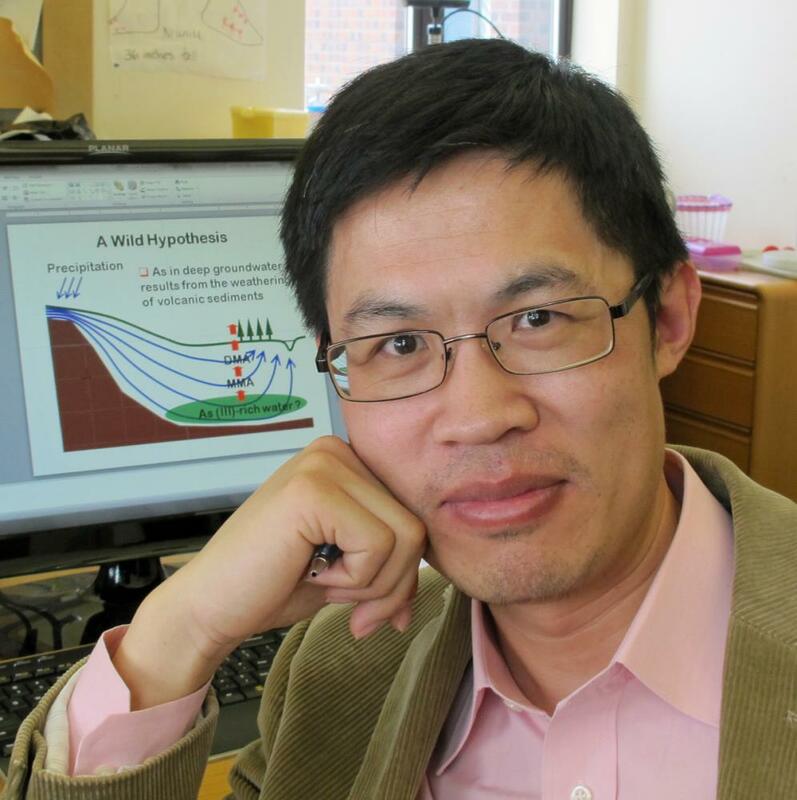 His findings landed online March 9 in the journal Nature Geoscience. He urges scientists to pay more attention to the presence of organic arsenic — a series of carbon-containing forms generally considered to pose less danger than inorganic forms — when assessing drinking water quality. Currently such assessments look at total arsenic, which is commonly assumed as pure metalloid form, and consider anything above 10 micrograms per liter to be cancerous to humans. Jin's paper reports a fundamental discovery of arsenic cycling in which organic arsenic forms represent a mid-stage of a naturally occurring bacterial process. "No one has touched on the link between arsenic on the surface and in groundwater," said Jin, an associate professor in the UO Department of Geological Sciences. "Traditionally the presence of the organic form in groundwater has been ignored. The focus has always been on inorganic forms, arsenate and arsenite." That approach, he said, over-simplifies the view on arsenic levels and overlooks how human activities, including pumping and irrigation, or environmental factors such as heavy rain or drought may influence organic forms. Arsenic is a natural element found in abundance in the Earth's crust. It often changes forms as it moves through the environment. Central to his team's findings is dimethylarsinate (DMA). He describes DMA as a mishmash of dissolved organic forms in combination with inorganic arsenite and arsenate already floating freely in the water. DMA's concentration, researcher found, sometimes exceeds 10 percent of inorganic arsenic and always correlates well with the overall arsenite level. Eventually, the cycling can turn arsenic into arsine, a volatile gas similar to fluorescent phosphine that rises as the result of decomposition in graveyards. In the field, Jin's team gathered water samples at depths ranging from 66 to 131 feet from 23 wells located on rural properties near Creswell. In 10 of the wells tested, DMA concentrations were as high as 16.5 micrograms per liter. The aquifer consists of volcanic sandstone, tuff and silicic ash, overlaid by lava flows and river sediments. The basin floor dates to 33 million years ago. Organic arsenic in the aquifer, the researchers noted, is similar to that in aquifers in Florida and New Jersey in the United States and in Argentina, China (Inner Mongolia and Datong), Cypress, Taiwan and West Bengal. Arsenic in groundwater is a challenge worldwide, including all 48 contiguous U.S. states. To test the hypothesis that native bacteria drive arsenic cycling, UO doctoral student Scott C. Maguffin conducted three laboratory experiments involving dissolved arsenite and arsenate taken from wells in the study area. The addition of ethanol in the final experiment stimulated bacterial activity, resulting in DMA concentrations much higher than those found in the field. The findings, Jin added, open a window on naturally occurring arsenic cycling and how, eventually, it might be manipulated to treat arsenic-contaminated water. "The cycling is important," he said. "This basic science provides a conceptual framework to understand arsenic behavior in the environment."